I have seen several claims of poor performance of the C128 when running CP/M, and would like to better understand these claims, especially in comparison to other CP/M machines of the early to mid-1980s. The C128 has a Z80A microprocessor clocked at 4MHz for running CP/M. This is the same processor and clock speed found in, for example, the TRS-80 Model 4. Both those machines were CP/M compatible, but I have seen claims that the 4MHz clock speed was not fully utilized by the Z80A in the C128. Specifically, I have seen it stated that the C128 Z80A only runs at 4MHz half the time. Is this statement true, and why should this be the case? Also, are there any benchmark results published to substantiate poor C128 CP/M performance when compared to similar Z80A systems? (2017.03.03) I have added a second answer with diagrams and more technical details. This answer is already huge and self-contained; the other focuses on the complexities due to hardware. Why does the C128 perform poorly when running CP/M? The 8502 is responsible for most of the low-level I/O functions. The request for these functions is made through a set of mailboxes. Once the mailboxes are set up, the Z80 shuts down and the 8502 starts up (BIOS85). The 8502 looks at the command in the mailbox and performs the required task, sets the command status and shuts down. The Z80 is re-enabled; it then looks at the command status and takes the appropriate actions. Updates to the screen were s-l-o-w. I believe this was due to the impact #2 had on interacting with the 8563 video controller. Although a block mode character transfer was possible, apparently the complexity of the dual-BIOS layers led to only one character being written to the screen per BIOS call. To write a character, two 8563 registers needed to be updated, which were the hardware pipeline to the 80-column video memory. That all amounts to a heckuva lot of overhead per character. Some users only had the classic C64 model 1541 disk drive. This was already known for being very slow (to be fair, "faster than cassette"). The newer 1571 drive, released with the C128, was three to six times faster, had double the capacity, and supported several CP/M formats used by other manufacturers. Some of these issues were clearly not due to hardware limitations, but stemmed from a lack of optimization for the drivers used in CP/M. 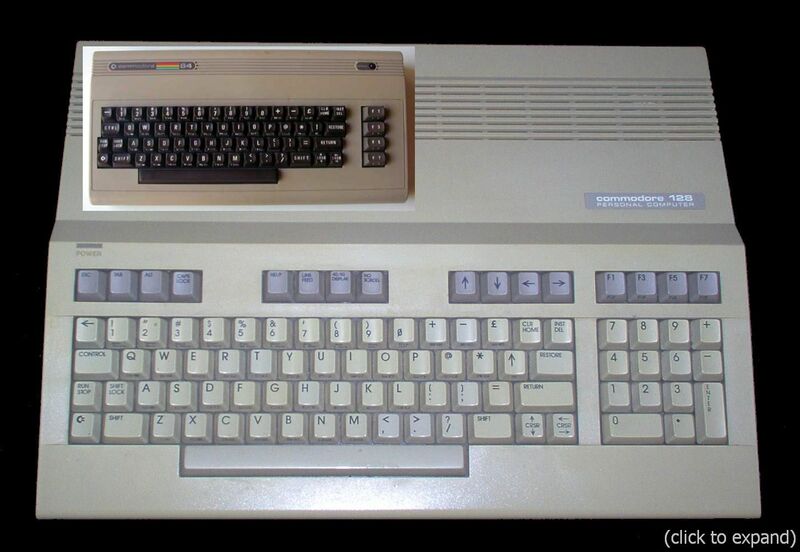 The engineers were on a tight schedule and implementing something that wasn't even part of the original C128 design. They would have had to rewrite the 8502 BIOS code in Z80 assembly language, but they were primarily hardware guys. I'm sure Commodore didn't want to spend extra money to optimize a feature they hadn't even asked for. So the simplest, most reliable route was to make calls to the already working and well-tested 8502 BIOS. A 1999 update to C128 CP/M, by Linards Ticmanis, addresses some of the CP/M driver performance limitations of the original and purports to improve 80-column screen updates by 75%. After fully reading reference #2, my understanding of the development bottleneck for the CP/M BIOS was clarified. The C128 team did have an excellent CP/M expert working off-site. It was never his goal to have the CP/M BIOS call the 8502 BIOS. Unfortunately the Commodore MOS group (the chip developers) had long-standing major problems delivering a working, stable, and reliable 8563 80-column video controller. This chip had been part of a Z8000 (16-bit version of Z80) Unix computer, the "C900", Commodore had once worked on, and apparently the chip had never been completed even for that use. Thus the 8563's fundamental design was based on an entirely different bus structure than the C128 offered. The 8563 samples the C128 team received would tend to burn themselves up, arrive with documented deficiencies, and, in general, be altogether unreliable throughout most of the development process. The CP/M guy could not use current hardware. He had a board with an older 8563 revision that wouldn't burn itself up and mostly worked. (He had to keep it cool with an ice cube sat in a tray above it, though.) But ongoing changes to the chip must have kept invalidating his BIOS. My guess is at the last minute he was told something like, "Look, we'll eventually get the I/O working in house with the 8502 BIOS. You just make calls to that, and we'll make sure on our end that it eventually works right." Z80A only runs at 4MHz half the time. Why should this be the case? The Z80A, a 4MHz version of Zilog's standard Z80 processor, is included as an alternate processor in the C128 system. This allows the C128 to run the CPM 3.0 operating system at an effective speed of 2 MHz. The Z80 is interfaced to the 8502 bus interface and can access all the devices that the Z80 can access. 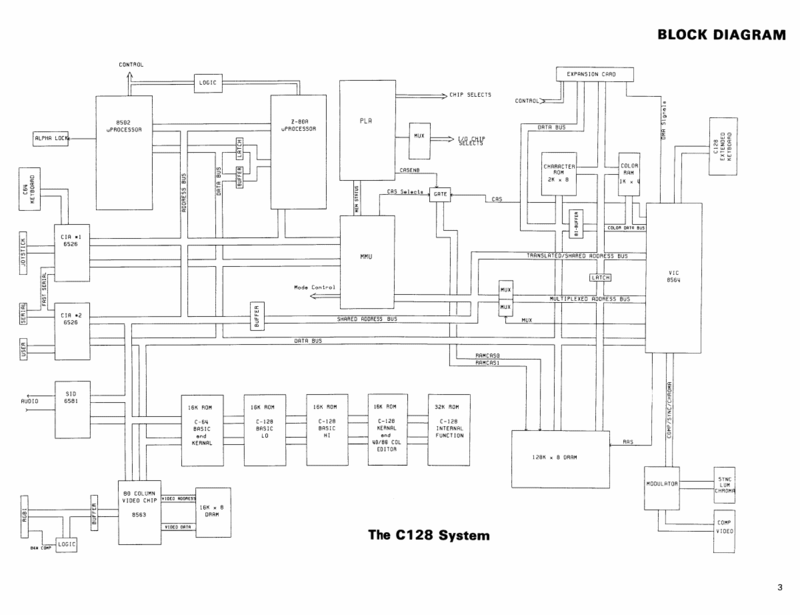 The bus interface for the Z80 (the most complex part of the Z80 implementation) is described in this section, along with Z80's operation as a coprocessor in the C128 system. Because a Z80 bus cycle is much different than a 65xx family bus cycle, a certain amount of interfacing is required for a Z80 to control a 65xx-type bus. Since the Z80 has built-in bus arbitration control lines, it is possible to isolate the Z80 by tri-stating its address lines. Thus, both the Z80 and the 8502 share common address lines. The interfacing of the data lines is more complex. 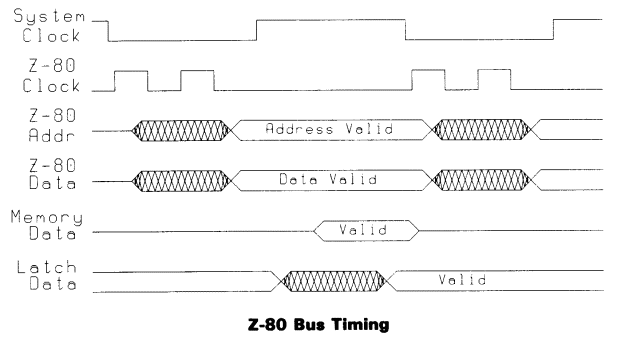 Because of the shared nature of the bus during Z80 mode, the Z80 must be isolated from the bus during AEC low. Thus, a tri-statable buffer must drive the processor bus during Z80 data writes. The reverse situation occurs during a Z80 read—the Z80 must not read things that are going on during AEC low; it must latch the data that was present during AEC high. Thus, a transparent latch drives the data input to the Z80. It is gated by the Z80 read-enable output, and latched when the 1 MHz clock is low. It will be seen that the Z80 actually runs during AEC low, but that the data bus interfaces with it only during AEC high. AEC: Address Enable Control. Indicates whether the 8502 processor or the VIC has access to the shared bus. When low, VIC or an external DMA has the bus and VA16 have the processor bus, and no pointer or BIOS translation takes place. This signal occupies pin 16. To put it bluntly, "It's complicated." The Z80A slowdown may be thought of as something like "wait states". Wait states are to allow a CPU running faster than memory to still operate, especially in an era before on-chip CPU caches alleviated the need for the CPU to access memory every (other) cycle. The problem on the C128 is that a 8502 CPU expects different things from its bus than a Z80 does. In the modern era, you can think of different motherboards being needed for different (yet current) '86 family CPUs. They can't just run the motherboards at slower and faster speeds and expect everything to work. Bil Herd and his team had to work with one motherboard and two entirely different CPUs. I was not able to find actual benchmarks. There were several accounts of users lamenting the C128's CP/M speed, and especially its screen updating. IMO the perception of this mode being slow was much more to do with the I/O bottleneck than the effective 2 MHz clock rate of the Z80A. There had been lots of actual 2 MHz CP/M machines using the original Z80; there were few complaints about their speed. But imagine using a CP/M spreadsheet and actually observing o n e c h a r a c t e r a t a t i m e being written to the screen. It'd be kind of annoying. My first answer attempts to answer all the OP's questions without going too deep into the hardware details. Since posting that answer, I have had the pleasure of corresponding for several days with Bil Herd, the lead designer of the C128 project. In addition to what I have learned from him, I have done some additional research on my own. 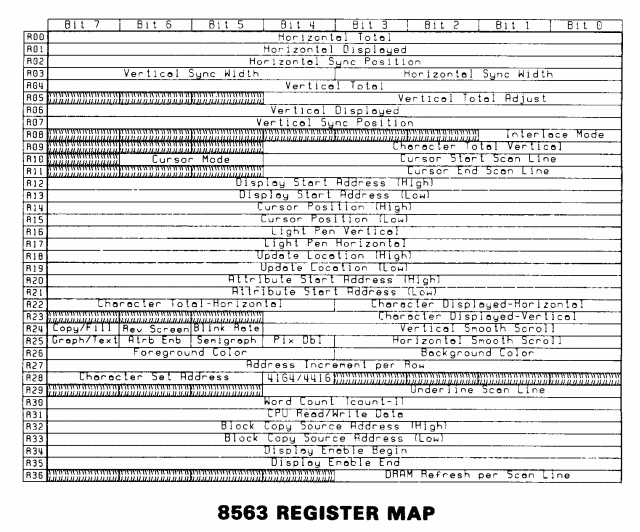 Here is the System Diagram, taken from page 3 of the C128 Service Manual (C128SM - click to expand): Remember the big deal I made of the 80-column 8563 Video Display Controller in my first answer? That's the tiny bit in the lower left corner. It is almost completely isolated from the rest of the machine, except for the address and data buses. That is why communication with the 80-column video RAM takes place via two registers of the 8563. The 8563 has 37 registers total, allowing control of number of characters per line, number of lines, cursor position, video synch, etc. a Z80A computer for running the CP/M operating system. It runs at 4 MHz, "half the time". "Okay, I sort of get it. The Z80 clock is only running half the time. I see it, but that does not explain why?." The system clock is a 1 MHz clock provided by the VIC chip. In modes #1 and #2 it lets the 8502 run half the time, and allows itself half the time to update 40 column video RAM, move sprites, etc. One nice thing about 6502-family chips is that turning over half their time to something else costs them nothing, so they share with other stuff on the bus easily. In mode #3 it runs at 2 MHz and drives the 8502 at 2 MHz. Since the 40-column display is not active, the VIC need not worry about sprites and ignores the 40-column video RAM. Note, though, that this 2 MHz mode would not help the Z80A; at best it would simply force that chip into a semi-even 2 MHz mode. The VIC chip contains a register which allows the C128 system to operate at 2 MHz instead of the standard 1 MHz of the C64. This operating speed, however, disallows the use of the VIC chip as a display processor. This bit is bit zero in register 48, and setting this bit enables 2 MHz mode. During 2 MHz operation, the VIC is disabled as a video processor. The µProcessor spends the cycle full time on the bus, while VIC is responsible only for dynamic RAM refresh and DMA arbitration. Clearing this bit will bring back 1 MHz operation and allow the use of the VIC as a video display chip. During refresh and I/O access, the system clock is forced to 1 MHz regardless of the setting of this bit. There is even another reason for keeping the VIC alive during CP/M. Look again at the C128 System Diagram, focusing on the upper right corner. See the little box labeled C128 Extended Keyboard? What is that about? Imagine using a business application with just the C64 keys. To get the rest, the VIC needs to be active. Well, "the rest" except the CAPS LOCK at the top of the keyboard. It operates as a simple switch, separate from the 2-dimensional keyboard matrix, and its value is fed directly to the 8502 CPU. That means the Z80A cannot read that one key directly. However, since normal CP/M I/O is indirect and utilizes the 8502 and its BIOS, that key value is available. Only a pure Z80A routine lacks access. However, such a routine would be affected by the value of the separate SHFT LOCK key. BDOS layer - device-independent I/O handling for CP/M. BDOS can handle a full string, but must call steps 3-8 character by character. Lets look at the heart of step #6 as an 8502 disassembly, beginning at location 0181F (not the actual BIOS85 code, just an example of what it needs to do). All 80-column screen communication occurs through the two 8563 registers, mapped to memory locations $D600 and $D601. Figure 10-2 illustrates this, from page 295 of the C128 Programmer's Reference Guide. $D600 tells which of the thirty-seven 8563 registers you wish to read or write, and $D601 is the location to read or write the data. Since the 8563 is often occupied with its own memory and driving the 80-column screen, it can take time to handle the $D601 value. That's why you must always check the $D600 STATUS bit before reading from or writing to $D601. One useful feature of writing to register 31 (data register) is that the screen location auto-increments after the write. You need not manually increment it. Don't assume the 8563 has a poor design. Normal (non-CP/M) 80-column C128 programs run with no noticeable delay in screen writes. The CP/M bottleneck is not the chip itself; it is the many layers of code through which screen writes must undergo. Time is also allocated for horizontal and vertical synchronizations. Modify the synch values, and it can generate screens of more than 88 characters by 30 lines. Turn on interlace, and you can even double the number of scan lines. That's the output end. From video RAM it must read the 80 character codes per line, read the associated byte of attributes for each character (color bits for (red, green, blue, intensity), as well as modifier bits for (alternate character set, reverse, underline, blink)). Finally it has to read the character definition RAM so that it knows what each character looks like. The 8563 character RAM is loaded during system boot-up, and both of its 256-element sets of 8x8 characters can be redefined by application programs. Internally I'm sure that some of the data is buffered within the 8563 (such as the current and maybe next character lines of data), but I don't know. The point is, no matter what's going on with the I/O ports at $D600 and $D601, the 8563 is extremely busy doing its job of displaying the screen. One more thing – because neither C128 BASIC 7 nor CP/M support it, few people realize the 8563 can also operate in a 2-color bit-mapped mode. ... not a poor design at all. I'll end with showing the 8563 register map to give you an idea of all the things this chip is handling. This is from page 37 of the C128SM. So, even though the chip was rated for 4MHz, it was never actually run at that speed in the C128. As far as I know the Z80 only runs at the same 2MHz the 8502 runs at. Which, internally, works out to 2/4=0.5MHz. Which is just plain slow. Source: a guy who came to visit our desk last night and knew everything else about the machine. So take with a grain of salt and downvote as much as you like. Others have pointed out the slowness causes, but here I will point out some solutions. Firstly, switch to ZPM which is a Z80 BDOS replacement for the 8080 based CP/M BDOS. CPMFAST is another option to speed up the general OS. Not the answer you're looking for? Browse other questions tagged cp-m commodore-128 benchmarking commodore or ask your own question. Can the two CPUs in a commodore 128 run at the same time? Why did CP/M require RAM in the bottom part of the address space?